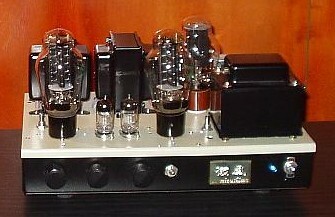 Driver tubes are 5687, double triode computor valves.consist 2 stages C-Couplig Drive. NC-20F.Audio OUTPUT Transformer are XE20S same as WE417A / 2A3 Single Ended Amplifier. this amplifier is compatible for 45 and 2A3 valves.change filament voltage with one of Switch. Max power is 3 W rms for 45 and 7 W rms for 2A3 getting from Transformer Drive. 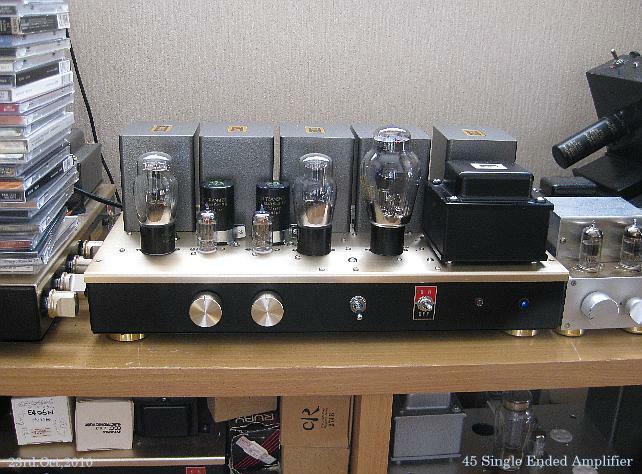 45 sound feel like not 45 original sound from this amplifier.off course 2A3 single ended amplifier. if same circuit using for 300B ,good enough 300B single ended amplifier than C coupling amplifier. sound is need adjust with resistace of 2ary of NC20F(terminated resistance). 2dary of NC20F resistace are choose 47Kohm , sounding is 100 time better than open. now I can use with termination resistance because drive amplifier has enough gain. 7119, E182CC , 5687,5687WB,7044 valves can be use as this driver. by MOS FET regurator. 1st stages +B is 215V regurated by Zenner diode with 2SK1120. each driver power supply are using Black Gate capacitor. result: sounding is very natural and very clear sound getting.sound is very musical. load of first stage 5687 and cathode resistance of 2nd stages and B+ of 2nd stage. 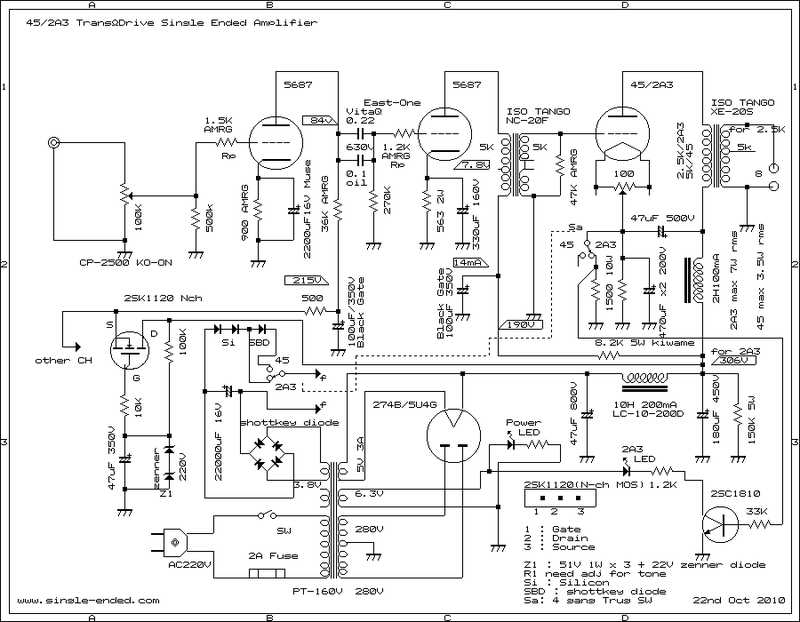 input of 2nd driver amplifier.indicated as Rp first one is 1.5K and 2nd one is 1.2K ohm. if does not get noise when move potentiometer,It's not necesary to connected Rp resisitance. 2nd 1.2 K ohm Rp is very effective.sound quality are same. valves pins.why I did use ? because client would like to use.only one thing. to use Yamaoto product any more. very bad. 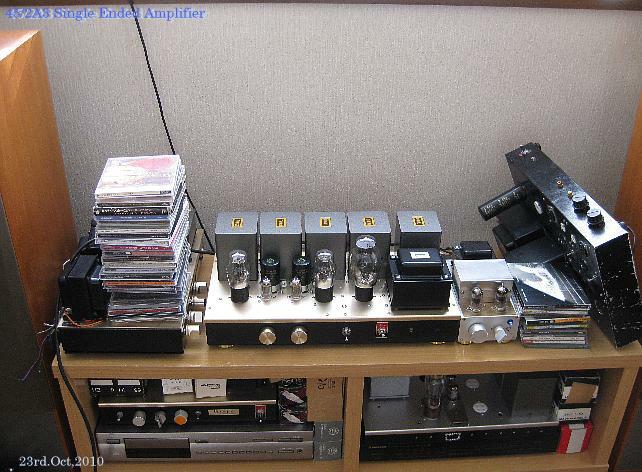 these kind of amplifier needed at least 91dB/m/w speaker system.over 92dB is best. 2A3 is just like 300B single ended sound getting.what do you think ? 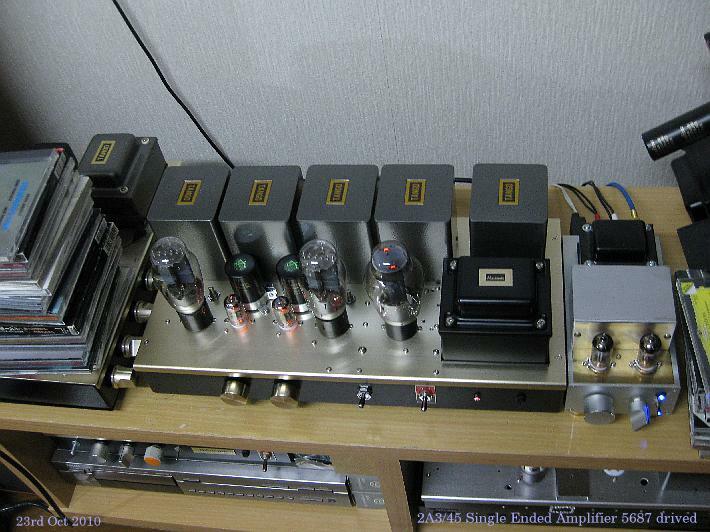 This Amplifier real cost is appx USD $ 5000 dollars. Is Inter Stage coupling Amplifier good ? good amplifier with C coupling and better than IST coupling Amplifier. good bass and more power than C coupling Amplifier.